Atlanta International Auto Show 2017 – Featuring Mercedes-Benz! The Atlanta International Auto Show is this weekend at the Georgia World Congress Center. I stopped by to see what was on display. Mercedes-Benz brought the big guns this year! The not-yet-released GT C Roadster is absolutely perfect! It’s like they knew I would be there and brought my favorite color combo! The lines on this car are so elegant and sporty. It could not be better! The G550 4×4² is the star of any show it attends. I think this one is designo Manufaktur Paprika and it brought the crowds! The Mercedes-Maybach S650 Cabriolet is expected to be limited to 30 units for the United States! This looks very much like the S550 or S63 cabriolet but turned up to 100. The extra diamonds in the interior and the exterior trim make it extremely special. The soon-to-be-released 2018 E400 coupe Launch Edition in Magno Matte Cashmere White was one of my favorites. It looks tremendously different from the current body style and distinct from the C-Class coupe. The 2018 GLA45 AMG was showing off some yellow trim and a major roof spoiler. This is a refresh for the GLA-Class. The 2017 Mercedes-AMG C63 Cabriolet launch edition was present! This is the car I call S’more because of the marshmallow exterior and the chocolate and graham cracker interior. It really is a knockout! The GLS63 AMG looked aggressive in white with black trim. I don’t get to see nearly enough of these at the dealership. The SMART car display was getting a lot of attention. We have been selling quite a few of the plug-in electric version on our pre-owned lot. It really is fun to drive! The E400 Wagon has arrived! I was hoping for the AMG variant but it is always good to see the wagon on display. Electric cars are starting to become more common for Mercedes-Benz and this S550 electric showcases the classic looks with new technology hiding inside. There were definitely some other vehicles at the auto show but only one will stick with you. For me it was the GT C Roadster! Look at that face! Special thanks to my colleague Michelle for additional photography! It is always hard to get a good image when there are crowds! 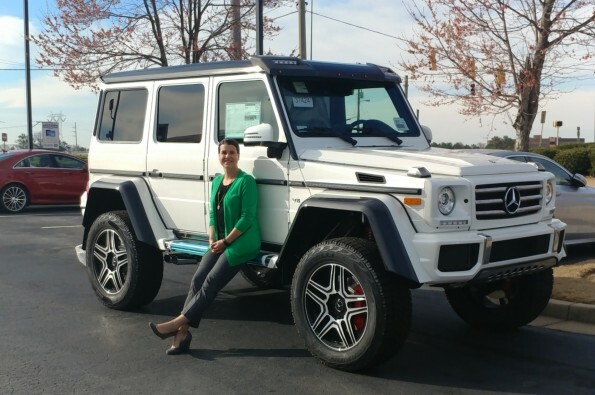 2017 Mercedes-Benz G550 4×4² at Atlanta Classic Cars! 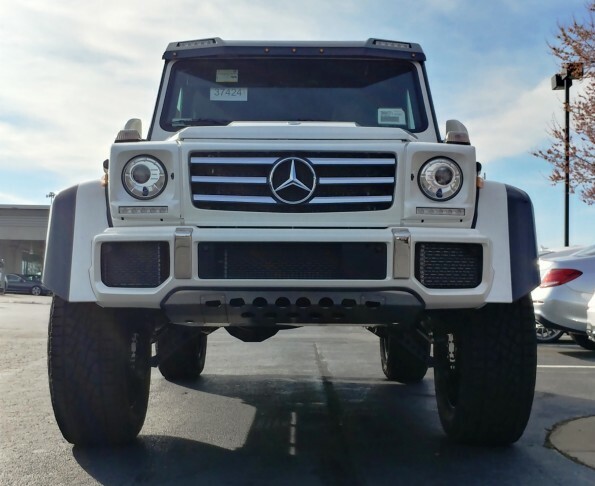 The iconic G-Class now has a monstrous brother! The 4×4² stopped by today for a moment and I took all of the pictures! 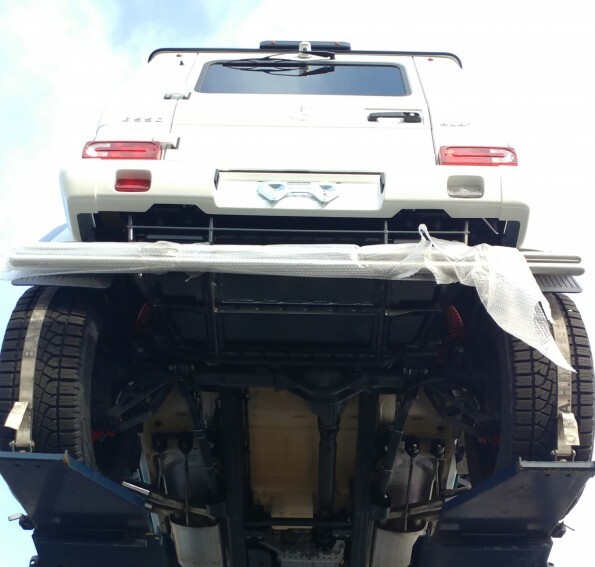 This beast is essentialy the famous G63 6×6 minus one axel. It is tall, looming, beefy, wide, and very cool. This particular vehicle is destined for another dealership but it was briefly unloaded and it is amazing! I saw it pull in and my first though was “Why is there no wheel on the back?” My second though was “it’s gigantic!” and then I realized that it was the first 4×4² that I had seen in real life! This vehicle uses the series production G-Class body, variable chassis and all-wheel drive powertrain including portal axels from the G63 6×6 to create a unique off roader with so much presence! There are almost no choices to be made when ordering the 4×4². Paint color is the only variable. All of the interiors will be the Black Dinamica with white contrast stitching. Can you see the diamond quilting on the doors and seat inserts? 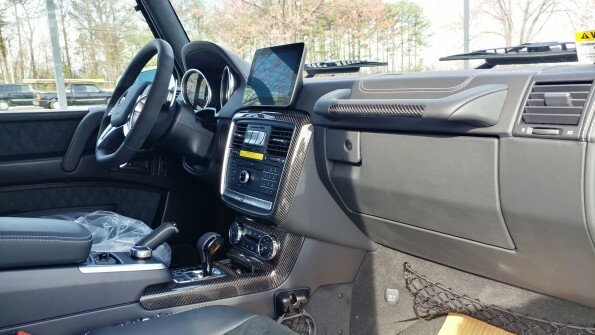 The trim is carbon fiber both on the inside and outside of the vehicle. Most of the advertising has featured the Electric Beam yellow paint. This one opted for the more subdued designo Mystic White. The extra-wide stance is intimidating! Look at the extra carbon fiber width added to the fender flares to accommodate the giant wheels and tires! The front roof spoiler with lights is almost exactly the same as that of the G63 6×6. The sticker quoted fuel economy at 11 mpg for both city and highway. 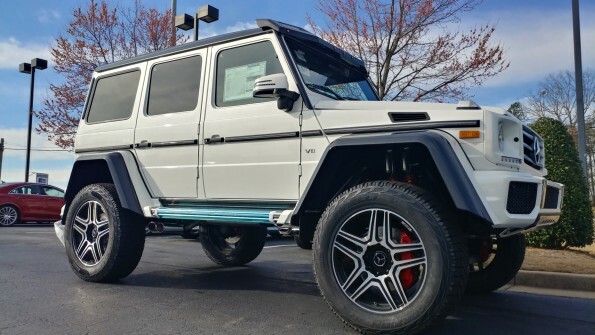 I can’t find the details for this vehicle on MBUSA.com but here is a link to the European specs. This vehicle is now available for sale in the US with a base price of $225,000. I am expecting my first unit in April/May. Here is a video of the formerly big G550 being unloaded from under the enormous G550 4×4². Enjoy! 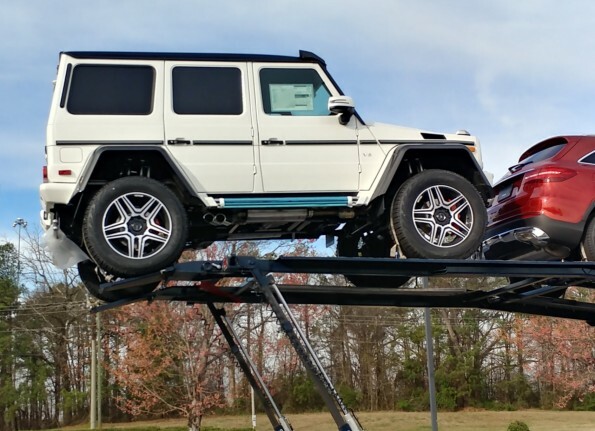 The 2017 Mercedes-AMG GLC43 Coupe Visits Atlanta Classic Cars! The 2017 Mercedes-AMG GLC43 Coupe is now available for sale in the US! My AMG trainer brought one by the dealership today so that we could see it before the first one arrives! The GLE coupe has been out for about 2 years now and has been a huge success. My clients have loved having the functionality of an SUV in a less traditional wrapper. The GLC grows this segment with a smaller footprint. This would be a great vehicle for small parking situations! It has all of the presence of the larger vehicle without the size! I was only able to drive it across the parking lot but it was excellent! It has better visibility than you normally see in coupes and the seating position is high without being tippy. This particular vehicle had the standard dinamica interior and it felt very sporty. With the Dynamic Select set to Sport+ it has all of the growl of the bigger AMG vehicles! Since this is an SUV we should talk about the storage. It has a large cargo area with a very large opening. It isn’t as tall as a traditional SUV in the back but it makes up for it with a very flat floor. The GLC43 is also standard with Air Suspension which allows the car to squat in the back for easier loading. This is an option in the GLC300. If you watch the video you’ll be able to see the cargo tray, scratch protector and cargo box in use. This makes for incredibly organized cargo! Nothing slid around at all! This is the only Mercedes-Benz SUV that is currently built in Germany! The GLC is built in Bremen and is available for European Delivery. This would be an excellent time of year to plan your vacation! We should be getting our first 2017 GLC43 coupe for inventory very soon. Please get in touch if you would like to schedule a test drive! Mercedes-AMG GLE43 AMG Test Drive! We just got a 2017 GLE43AMG SUV in stock and I had to take it for a spin! When Solarbeam Comes For Service! Test Driving the E43 AMG from Atlanta Classic Cars! Please do subscribe to my YouTube channel! Rally North America – I do like roadtrips! I am not planning a European roadtrip this year…maybe I need an American roadtrip? Has anyone done this? Anyone signed up? You Should Order Your Mercedes-Benz GLC Immediately! The Mercedes-Benz GLC is getting tons of good press because it is a great car! My clients are loving the luxurious ride, the plush interior and the excellent power. The down side of all this love is that supplies are small! I don’t have a large inventory and some desirable features are hard to get. If you are thinking about a GLC you should order ASAP! I recommend you visit your trusted sales professional (hopefully me!) to review the available features and get your order in the system. It will likely take 90 to 120 days to arrive and you are going to want a new car this spring! If you want to get really fancy you can order it for European Delivery and pick it up in Sindelfingen or Bremen, Germany! I can help! Take a look at this beauty arriving yesterday! This client wanted leather (hard to get), trailer hitch (almost impossible) and Burl Walnut Wood (Not in November or December). It took almost 5 months to get it done right but we did it and they love the result! Ben Loves the S550 Cabriolet! The Redesigned 2018 E-Class Coupe! Now, let’s see the cabriolet!